Tomorrow is the first day our EFCA Allegheny District theology conference which we call "Stay Sharp." I'm particularly excited because it's our tenth annual conference. We've been doing this for a full decade with the same speaker, Greg Strand, of our EFCA national office. I'm so glad to be a part of family of churches that values Biblical truth and good theology. If you'd like to follow along, I'll be updating this Facebook event stream with quotes from Greg and links to books, articles, and other resources he references during his teaching. Greg's powerpoint and the last several years' worth of Stay Sharp conference resources are available on the host church website. 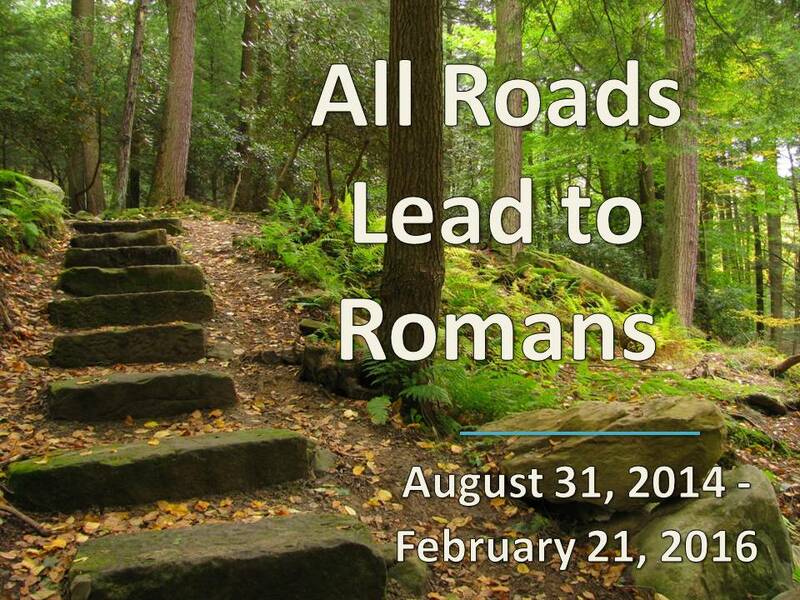 All 37 messages in the sermon series that ran from August 31, 2014 to February 21, 2016. 31. What Time Is It? Believe it or not, we’ve finally reached the end of the book of Romans. I told you when we started this series on August 31, 2014, that I was not going to be one of the those preachers who go into Romans and never come out again. In fact, I didn’t think we would take a whole year go through it. But now it’s February 21, 2016, and we’ve finally reached the last chapter. You might be surprised to hear that this is only the 37th message in this series. So it’s really been only 2/3 of a year’s worth of sermons, it just took me almost two years to write and deliver them! But any way about it, here we are. Which, if you’ve ever read it before, can seem on first glance to be a pretty...boring part of the letter. Chapter 16 is not as elaborate or eloquent as the explanation of the gospel in chapters 1 through 7. Chapter 16 does not soar like the great chapter 8. Chapter 16 is not as thorny in interpretation or pointed in application as chapters 9 through 15. But Romans chapter 16 is important. And it is holy Scripture. Yes, most of it is a list of names. Some of them, hard to pronounce names. As I’ve said before, I don’t pretend to know the correct pronunciation of all of these name. I’m just going to fake it and make it sound like I do. But Romans 16 is not just a list of information. It is the Word of God. And that includes Romans 16. This chapter is just as inspired as John 3:16 even if it’s not as important as that passage or others in the Bible. Romans 16 is holy Scripture. I love that. Because it means that even as I read and think about these greetings that Paul sends along, I can expect to learn and grow through them. I can expect to be thoroughly equipped through Romans 16 for every good work. 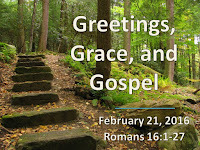 I can expect to receive grace from reading Romans 16 and grow in God’s gospel. Paul begins his ending with a commendation. Let’s look at verses 1 and 2. What can we learn from these two verses? Well, first of all, we are reminded that this is a letter from real people to real people. Sometimes we fall into the error of thinking that this is all just a fairy tale or a myth. That Christianity is basically just a set of abstract ideas with some stories attached to them. But Christianity is deeply historical. It is embedded in and arises from history. When we read these names, and there are 26 separate people named in these verses, we are reminded that these were real people with real needs and real deeds who really lived. There really was this woman named “Phoebe.” And she was almost definitely the bearer of the letter to the Romans. She was the carrier of the Epistle to the Romans. Phoebe carried it, probably from Corinth, where Paul was, to Rome. Cenchrea is a port city near Corinth. Kind of like a suburb of Corinth on the sea. And she was a servant (Greek word “deakonon”) of the church there. She served that church faithfully and has now traveled all the way to Rome. She’s a real woman, and she had some needs. I think that the second thing we see. It’s not just that this is history, real people. But they had real needs. And they needed each other. V.2 again. I think that’s interesting, don’t you? Paul had needs? Phoebe probably had some wealth, enough to travel, at least. And at some point she had been benefactor, a patron, a helper to Paul. Ministry is a team sport. We need each other. That’s one of the big take-aways from a passage like Romans 16. We need one another to do ministry. So, the Wild Game Dinner, for example. Andy can’t do that on his own. Everybody needs to play their part whether it’s simply praying for the event or showing up with an apple pie or a crockpot of venison chilli. We need each other. Gospel ministry is a team sport. And women get to play on that team. That’s third thing I see here in just the first two verses. Phoebe is a sister in Christ. And she’s carrying the Epistle to the Romans! Some people have the mistaken idea that the Apostle Paul was anti-woman. Or that Christianity is somehow anti-woman. As we read these verses, you might be astounded to see how many of Paul’s friends and co-workers in gospel ministry were ladies. Just because Paul taught that there were some leadership roles in ministry that men alone should fulfill, the ones bearing the brute brunt of responsibility for the home and the church, doesn’t mean that Paul belittled or devalued women and their contribution to the church and its gospel mission in any way shape or form. We’ve got a great set of ladies in this church, and they are active in gospel ministry and should be honored. Like Phoebe was. Ladies, every time you hear a female name in this chapter (and there’s going to be a bunch), think of your name being put in there, too. And it sure seems to me that Phoebe was a single lady. There’s no mention here of a husband. So, I think it’s a shout to the single ladies, too. Christian sisters full of the gospel and worthy of commendation. We’ve got a bunch of you here, too. We have got a church with a good many Phoebes in it, and we are blessed because of you. Don’t worry. I won’t take this much time for every name on this list. But you get the idea? These names are important and what Paul says about these people is important. It’s holy Scripture, and we can learn from it. In verse 2, Paul turns from commending Phoebe to greeting the people in the Roman church that he knew. Some he probably knew better than others and some he may have only known by reputation. It’s hard to say. But he greets them. Paul greets people in other of his letters, but this is the longest greeting of all of them. Colossians, another letter written to a church he’s not met, is the only one close to this one, and there are a lot more names here. These are Paul’s personal greetings to these people. Every time it says, “Greet,” think, “I send my personal greeting to...” whomever. Wow. Wouldn’t you love to receive a greeting like that from Paul? We learned about this ministry couple back in the book of Acts. Priscilla and Aquila (interesting that she is named first here and everywhere else they are mentioned in the Bible, Priscilla and Aquila) were tentmakers like Paul was, and Paul met them on his second missionary journey, and they were the ones who schooled and straightened out the great orator Apollos in the gospel. What Paul emphasizes here is that they risked their lives, literally “risked their neck” for him. We don’t know how, but Paul did. And he was very thankful. And so were all of the Gentile churches. One of you asked me last week, if Paul didn’t plant the church in Rome, where did it come from? And we don’t know who planted it, but by this time there was a already a number of Christians in it from other parts of the Roman Empire. We aren’t told any more about this Mary, but what we know is enough. Isn’t it sweet? Some Sunday, I should stand up here and just greet each one of you by name and say something wonderful about you. Something that the Lord has done through or in you. How would that make you feel? Paul knew Mary and so did the church at Rome and they both knew how hard Mary had worked for them. How she had ministered among them. And the Lord knew, too. It’s likely that these two are a married couple, as well. Though there is some question about whether Junias is a male or a female name. Either way, they were active in ministry and reaching out. Perhaps they were a gospel missionary couple like so many of those couples whose pictures grace our back wall. They were Christians before Paul was. Maybe they planted this church? What I want us to not miss is that little word “relatives” in verse 7. Did you see that? I don’t think that means that they were cousins. I think it means they were Jewish. Most of the names here are not Jewish but a few of them are. That brings back home all that we’ve learning about Jews and Gentiles in this church, right? Do you feel the love here? The church is a family. It’s not just a bunch of people who believe the same thing, but the gospel brings people together into relationship, into community. Paul loves these folks, and he’s not afraid to say it. Greeting others is a good and biblical and loving thing to do. We take greetings for granted, but they are a wonderful blessing. I hope that you were all warmly greeted by many people as you came in today. And I hope that you all warmly greeted many people as they came in today. You don’t have to do it just like Paul did. But presents a great model. He not only greets them but commends them for their hard work in the Lord. It’s not wrong to commend people for their ministry. It’s right and good and loving. I love what he says about Rufus and his mom, huh? This might be the same Rufus who was the son of Simon of Cyrene, who carried Jesus’ cross. We’re not sure. What we are sure of is that he was chosen in the Lord and his mother had been a mother to Paul! We need more of that in the church. We need moms to be moms of people without moms. And moms to be “second moms” and “third moms” to people. Paul needed a mom, and Rufus’ mom fulfilled that for him. Moms, who can you be “adopting” so to speak for the sake of the gospel, out of love for the Lord? The church is a family. And it’s an adopted family. There’s more we could say about these names. Heather pointed out to me that a number of them had the names of Greek and Roman gods. And strangely, they didn’t see the need to change them. Like Daniel in the Old Testament. That’s interesting. Another interesting thing is that these names are common names for different levels of society in that time and culture. There are people here from every social strata. Every level of social class! Some of these folks were slaves. Some were freemen. Some were citizens. Some were poor. Some were rich. Some were rulers. It’s not just that some were men and some were women. These folks had nothing in common culturally with each other in the rest of their lives. But now they were family in Christ! The church is supposed to be diverse. We are supposed to be different from one another. Different races. Different ethnicities. Different political parties. Different social spheres. Different financial classes. Different nationalities. We are all supposed to be different and brought together as one in Jesus. If you look around, and you don’t feel like you quite fit with this church culturally, I say, look again. We want different here. And verse 16 gives the command. This greeting stuff is not just for Paul or for then and there. It’s for today. It’s okay with me if we don’t kiss. But we need to greet each other. We need to welcome and love and express our affection and care and support and respect and regard for one another. “All the churches of Christ send greetings.” The churches Paul had just served all send their greetings to the Roman church. That’s what Christians do. We love one another, and we tell each other. Here’s some people to not greet. In fact, we’re supposed to show them the door. They are false teachers. They are snakes. They are wolves in sheep’s clothing. They are smooth talkers, but they don’t love Jesus and they don’t really love you. They just love themselves. Paul is warning these Christians that there are people out there who claim to be Christians but are actually troublemakers. And there are more today than there were then. That’s people who won’t strive for unity, like we were learning about in chapters 14 and 15. And they don’t do because they are “contrary to the teaching you have learned.” That’s the gospel. They are believing and teaching a different gospel. Maybe it’s gospel of works. You have to earn your salvation. Maybe it’s a prosperity gospel. Where you are guaranteed health, wealth, and prosperity if you believe it. Maybe it’s a painless gospel. Where you are promised that you won’t experience any hardship. But Jesus said that in this world we will have trouble! Those are false gospels. There are plenty of them out there. And there are plenty of people trying to sell them to the church. Paul warns the Romans to be on guard. Are you on guard against false teaching? There’s stuff out there that you have to beware of. You’ve got to know what is good and not dabble with what is evil. And you have to be able to tell the difference. I’m afraid that many Christians have very little discernment. And there are people who can’t wait to take advantage of that. Does that verse sound familiar? I hope so. We previewed it back around Advent this last year when we learned about the First Gospel in Genesis 3:15. The God of peace will soon crush Satan under our feet. The God of peace. That is the God who brings peace either by enforcing it or reconciling His enemies to Himself. Either way, He brings peace. He will soon crush Satan under our feet. Not just the foot of Jesus, but ours. In other words, the victory of Jesus will be experienced by us, His people. The false teachers and false Christians will not win. As they are snakes, they will, too, be crushed. We don’t deserve rescue from Satan and His people. But we sure need it. Because of what Jesus did on the Cross, we are promised peace with God and our enemy crushed. Isn’t that good? That’s the gospel! And then he comes back to the gospel. This last paragraph has a lot in common with the very first paragraph. Some time, maybe this afternoon, open up both at the same time and look at the similarities. Paul is giving glory to God through Jesus Christ because He is so wise. He was wise enough to have the gospel be a mystery, something hidden, still running in the background like a program behind the scenes on your computer, and then at the exact right time bring it to the light of day. Making known the good news so that all nations might believe and obey Jesus. Believe in Him as Savior and follow Him as Lord. But even us Gentiles sitting here in Lanse, Pennsylvania. The gospel came to us and it is able to (v.25) establish us. To strengthen us. To set us on our feet and give us a Rock to stand on. The gospel is powerful. It is the power of God for the salvation of all who believe. So we need to believe it, every one of us. And we need to (v.25) proclaim it to everyone. And as we do we join with the church throughout the ages who bring the Lord glory for His gospel. To the only wise God be glory forever through Jesus Christ. Amen. This passage of Romans is what I tend to call “the first ending of Romans.” So, we’ve reached the beginning of the end. 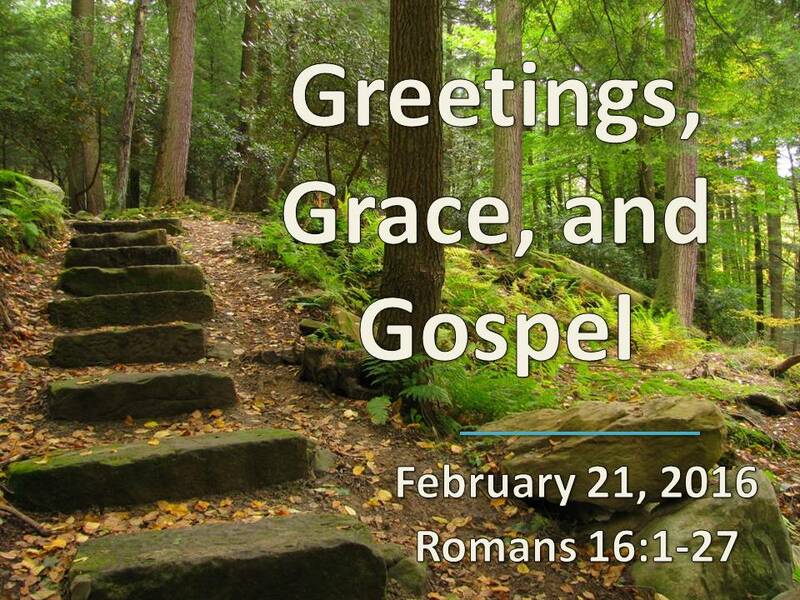 Next week, we’ll look at Romans 16 which is the second and extended ending of the book. But you really get the feeling when you’re reading Romans 15:13-33, that Paul is landing the plane. And the main reason is that in this section, Paul begins to circle back where he began the letter and tell them about his future plans for ministry. It’s the kind of thing you say to someone as you are rounding off your conversation and talking about the next steps. 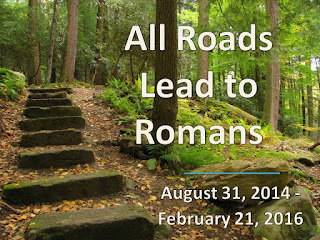 Paul has finished applying the gospel to the unity problem that the church was experiencing between the Jewish Christians and the Gentiles Christians at Rome, and now he’s going to explain what he’s going to do next which includes plans for a personal visit to this Roman church. I’ve entitled this message “Gospel Full” because four different times in this short passage Paul emphasizes the word “full.” Even in the Greek, there is one root word that we tend to translate “full,” and it appears in four different places in these few verses. Because of the gospel that Paul has been teaching them in the book of Romans, the Christians at Rome are not lacking in anything essential or important. They are full. They have abundance. Paul prays for abundance for them and assures them of the fullness of God’s blessings because of the gospel. Because of the gospel of Jesus Christ, we have everything we need and will have everything that we need forever and we should fully share that gospel with everyone else who needs to hear it. That’s what we’re going to see today as we read Romans 15:13-33. And I think that’s great place for us to be on Celebration Sunday 2016 as we celebrate 124 years of God’s Faithfulness to Lanse Evangelical Free Church. Gospel is our middle name. Evangelical means “centered on the gospel.” And because we believe the same gospel that Paul was sharing with the Romans, we experience the same gospel fullness that they did. 124 years of gospel fullness for Lanse Evangelical Free Church. Let’s start right where we left off last week. Romans 15:13 is a prayer wish of Paul for the Roman church. This is what Paul prays for them, and it’s what we are memorizing together. #1. FULL OF JOY, PEACE, AND HOPE. Paul prays that the God of hope, a God who he says I characterized by hope would FILL the believers at Rome with ALL joy and peace as they trust in Him. Have you prayed for joy and peace this week? I know I have. Paul prays that these believers would be filled with both of them. And he says that the joy and peace come AS THEY TRUST in the God of hope. We get more and more filled with joy and peace as we put our faith in our Lord. And in His gospel. In His good news. And Paul says that he prays that they would be so full of this joy and peace that they would overflow with hope. Joy, peace, and overflowing hope. That’s what I want for Lanse Free Church. And it’s bound up in the gospel. And it’s given to us as a gift of the Holy Spirit. May the Holy Spirit do that to us. He has given us so many gifts over the last 124 years. It has not always been easy. Those of you have who have been here a long time know that just because you have the gospel doesn’t mean that life is easy. In fact, if you have the gospel, Jesus says that life will be hard. “In this world you will have trouble. But take heart. I have overcome the world.” Jesus said that and He said that so that in Him we might have...peace, which gives us joy, which gives us hope (Romans 15:13). Let’s memorize this new verse together and every time we say it, let’s make it our prayer. Now, in verse 14, Paul tells them that he has confidence in them. It’s a little surprising. Look at verse 14. Paul has not written this letter because he thinks that they are all messed up over there at Rome. He has had some important things to teach them, but they were not different from what they had already learned. These folks at Rome already had the gospel. Even though Paul had never visited them yet! But he knows enough about them to know that they had the gospel right and that because of that they were good. #2. FULL OF GOODNESS AND COMPETENCE TO DO MINISTRY. You see that word “full” in verse 14? Now that doesn’t mean that they had all of the goodness that someone could ever want. Just like it says that they are complete in knowledge. Well, obviously they didn’t know everything. Here is Paul telling them things! But they had what was essential. They didn’t have an insufficient amount of goodness and knowledge. They were full of goodness and knowledge. They had the gospel! And they had it right. And that’s the basic requirement for doing ministry. Raise your hand if you are competent to do ministry. Every Christian should raise their hand. Every Christian who has the gospel has what it takes to do ministry. Not to do every ministry. Nobody but Jesus is competent to do every ministry! But the gospel qualifies us to minister to others. If you have the gospel, then God is calling you to serve others with it. In fact, Paul says that they are competent to “instruct one another.” Or to counsel one another. Or to admonish one another. If you understand the gospel, then that qualifies you to use the gospel in personal ministry with another believer. I may be the twenty third or whatever pastor of Lanse Free Church. But I am not the minister of this congregation. We are all the ministers of this congregation. You have what it takes to minister here. Find out what your gifts are and get busy doing it. I love how many people are involved in active ministry at Lanse Free Church. Some churches have an 80/20 rule. Have you heard of that? 80% of the work gets done by 20% of the people? But that’s not the percentages here. Here people get involved with the Wild Game Dinner, with the Celebration Choir, with the Greeting Ministry, with Kids for Christ and ABC Kids, with the Youth Group, with whatever needs done. And outside of those programs, we also minister the gospel to each other in person. Admonishing, counseling, encouraging one another. You know who was great at that? Blair Murray was. Blair never went to seminary. He was never formally ordained into the pastoral ministry. But he understood verse 14. He had gospel fullness. Blair knew that he had the gospel and that meant that he had what it took to minister to others. And he did to his last day. And I say verse 14 over you, church. So let’s continue to do it. Paul is saying that he’s been kind of strong with them, I think especially in these last couple of chapters, because they need to hear it. And he’s the guy to do it because he’s been called to be the apostle that really opens up the gospel to the Gentiles. And there were a lot of Gentile Christians at Rome! So Paul has a better handle on this than anyone else at this point in church history. He’s taking the gospel to the non-Jews. And he says that it’s like a priestly ministry. He’s like one of the Old Testament Aaronic priests, and the offering he’s bringing is the Gentiles. Christian Gentiles who have believed the gospel and are set apart by the Holy Spirit. Now they worship the Lord through Jesus the Messiah! Gentiles! Who would have guessed?! This might sound a little familiar. He said this sort of thing in his greeting, back in chapter one. It’s another sign that the letter is coming full circle to a close. Paul has been called to be an apostle to the Gentiles, and that’s why he’s writing. I think that’s another verse for us today on Celebration Sunday. It would be easy to pat ourselves on the back for being such a great church. And I am proud of you. You are full of goodness and competence to do ministry. But you get it from the gospel. You get it from Jesus. Paul doesn’t brag on himself and his accomplishments. He brags on Jesus. It was Jesus who led those Gentiles to faith in Christ through Paul’s preaching of the gospel. It was Jesus through His Spirit that did the miracles that attested to the truth of the gospel. It was Jesus who had accomplished these things through Paul, and so Paul bragged on Him. That’s what we’re doing today, too. We’re bragging on Jesus. We celebrate 124 years of Christ’s accomplishments at Lanse Free Church. 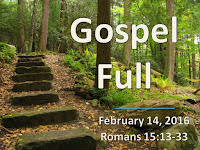 Of the gospel fullness that Jesus has given to us. Now there in verse 19, Paul said something that was pretty surprising, I think. #3. FULLY PROCLAIMING THE GOSPEL. Paul is saying that his mission has been accomplished. From the starting point of Jerusalem in Israel to the ending point of modern day Albania, Paul said that his gospel mission was completed, fulfilled. That’s somewhat surprising because I’m sure he would agree that there was still plenty of ministry left to do in those areas. They weren’t all Christians there yet! And not every single person from Jerusalem to Illyricum had heard about Jesus yet. But for Paul, his mission was accomplished. The gospel had taken root there. There was a certainly level of gospel saturation because he’d planted gospel-proclaiming churches. The gospel was fully proclaimed. And now it was time for him to move on. Paul hasn’t made it yet to Rome because he’s had too much work to do in reaching people who have never heard the name of Christ. He knows that other people will come after him and build on his gospel foundation. But he is called to break new ground. It is said that some of the pioneers here in America would pull up stakes and move whenever they could start to see the smoke from their neighbor’s cabins. It was time for them to head West. To virgin territory. That was Paul with the gospel. Not everybody has that calling. Some are called to stay behind and build on the previous foundation. That’s me. I know that I’m called to stand on the gospel foundation of those old Swedes who brought the gospel here to Lanse and started this work. But there are also plenty of people who don’t yet know Jesus as their Lord Savior in the world and in our community, so we need to stay committed to fully proclaiming the gospel to the world and to our community. The author John Piper has said that missions exists because worship does not. In other words, as long as there are people who don’t have the gospel, we have a mission to take it to them. That’s gospel fullness. We should be so full of the gospel that we want to fully proclaim it to the world. And to our neighbors. Not just to those folks in Oaxaca. Not just to those people living in the mountains that John and Roper are probably with right now. But to the people in Lanse and Winburne and Grassflast and Kylertown and Drifting, and Hawk Run and Morrisdale and Allport and Graham Township and Forest and Clearfield and Philipsburg and West Decatur. We’ve got some full proclaiming to do! Paul tells them about his plans. He’s hoping to go to Spain with the gospel. And Italy is on the way to Spain. So, he’s planning to make a stopover and encourage them there at Rome and share with some spiritual gifts. And also to ask for money so that he could go on to Rome. Do you ever think it’s weird for a missionary to ask for money? Heather and sister and brother-in-law are missionaries now to Germany and last year was a key year for their fundraising. It’s not always easy to ask people to give you money if you’re a missionary. But here’s Paul doing just that. It’s not a demand. He’s not coming to tax them a certain amount, but he is thinking that they will want to help him get to Spain with the gospel. They received the gospel, and now they’re going to give it away. Missionary support is that important. I love that our church supports so many missionaries. I love that the back wall is full of gospel proclaiming partners in ministry. And this church has done that for 124 years. I’ve read the history. It was very soon after our church was founded that we began to send money and missionaries with Frederick Franson, a Swedish church leader who was sending missionaries to China. That’s what we are all about. Gospel fullness means fully proclaiming the gospel in the whole world. Sending the gospel to those who need it most. He can’t help it, can he? He’s got to bring in the Jews and the Gentiles again. I think he’s making another subtle point about how they ought to be unified! The Gentile Christians in Macedonia and Achaia have taken up an offering to help the financially challenged Jewish Christians back in Jerusalem. We read about this special compassion offering in Paul’s two letters to the Corinthians. The Gentile Christians owed so much to the Jewish Christians because they had launched the gospel and even helped to launch Paul. They had paid it forward. And now the Gentile Christians were paying it back. Here’s another place where I’m proud of this church. You are compassionate and give help to people who need it. Not just the gospel, though that’s the most important gift. But also material blessings to the poor and the needy. 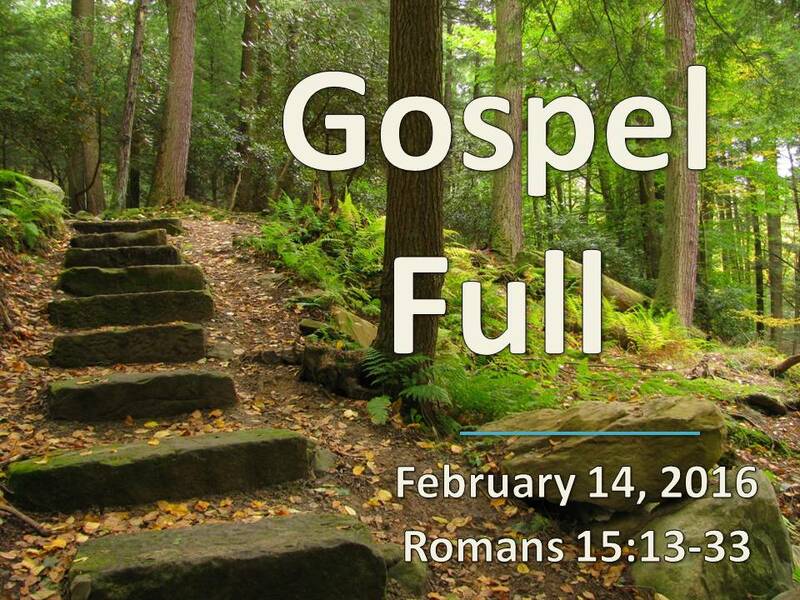 That’s our fourth and last gospel fullness for today. And it’s everything! #4. FULL OF THE BLESSING OF CHRIST. Paul believes that when he comes to Rome, it will be good for all of them. He believes that God has only good things in store. That they will share the gospel with one another and revel in it together. That they will experience the full measure of the blessing of Christ. I don’t know all of what that means, but it sure sounds good. And Paul is sure that’s coming. I think it basically means that Jesus is full of good things and that through His gospel we have everything good. And we will enjoy it together forever. Now, that doesn’t mean that it will come easily. It will come through trials and tribulations and trouble. Paul clearly knows that he’s headed into trouble. He calls up on them to pray by the name of Jesus and the love of the Spirit–those are big things to call on! And he asks that they pray for him to be rescued from the unbelievers in Judea and that the believers would affirm his ministry there. And then that Paul would make it safely to visit them in Rome. How did God answer those prayers? He said, “Yes.” But he gave Paul a crazy path to getting there. Read the end of the book of Acts to get the full story. But it included arrests, imprisonments, preaching before rulers, a journey on the Mediterranean like those Syrian immigrants are doing every day on those little boats. And a shipwreck. And a snake bite. God said yes to this prayer for the full blessing of Christ to be experienced by Paul and the Roman church. But it was through the fire. So the lesson for us, I think. Is that we need to pray for gospel fullness, as well. But to not think that means it will be an easy road to travel. If the Lord tarries, I pray that our church would stay faithful for the next 124 years. That we would trust in Jesus for joy, peace, and overflowing hope. That we would know ourselves to be full of goodness and competent for gospel ministry. And that we would fully proclaim the gospel of Jesus Christ to our community and to our needy world. But if we do, it won’t be easy. There will be trouble, trials, and tribulation. The devil will not be happy that we are doing this. But we can rest assured that because we have Jesus. Because we have His gospel, we have everything. We are full. We are full of the blessing of Christ. This is cool. My favorite publisher is sponsoring the popular blog of Tim Challies all week long. And to celebrate, they have a special offer of seven of their latest books for sale for seven dollars each bundled together for only $49. That's nearly a 50% discount off the retail price! Those are the best prices you'll find for those books anywhere and ordering is easy on the newly designed website for CLC Publications. 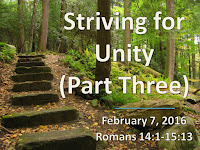 [Matt's Messages] "Striving for Unity (Part Three)"
Paul has been applying the gospel that he taught in the early chapter of Romans to the problem of disunity within the church. There were two groups of Christians in the church at Rome that were apparently struggling with one another. What were the two groups? Both were Christians, but some were ethnically Jewish. They came from Jewish backgrounds, and the rest were not. They came from other ethnic and religious backgrounds. And there was apparently tension between the two groups. Which of the two groups was more important? Neither, right? That’s a trick question. A bad question! The Jewish Christians had certain advantages. They were given the law and the promises and the Savior first. But there were already more Gentiles than there were Jews in the church at Rome! And the two groups were struggling with unity. So Paul has been laboring for all of chapter 14 and now will in this half of chapter 15 to bring the two groups together through the gospel and to strive for unity. So we’ve been learning how to strive for unity. How to make every effort to do what leads to peace and mutual edification because God cares about it so much! So far, Paul has given us two big steps to take in striving for unity. Don’t pass judgment on your brother over disputable matters. Do you remember what “disputable matters” were? They were secondary issues that genuine gospel-believing Christians could disagree about and still have fellowship with one another. There are indisputable matters that gospel-believing Christians cannot disagree about and still have true fellowship. Things that go to the heart of the gospel and cannot be denied. But there are other issues that genuine believers can and do disagree about and yet regardless can still, at the same time, maintain unity in Christ. What are some of those disputable matters? Well, even that is disputable, isn’t it? My list might be different from your list! I remember being taught this stuff for the first time in the book The Grace Awakening by Chuck Swindoll. I remember reading it in the Summer of 1993 when I was traveling with the circus. - Going to the movies or live theater. - Going to the beach. - Not having a “quiet time” every morning or at least every day. - Going to a restaurant that sells liquor. - Listening to certain music. - Holding a certain job. - Wearing your hair a certain way ([He says, “assuming you have hair” which I found funny in 1993!]). - Having lovely and elegant possessions. - Working out in leotards (pg. 163). That last one made me laugh yesterday when I looked it up. It made me think of the great online debate over yoga pants last year! Now, some of the things on that list did not surprise you. You know that Christians disagree about those things. But there are probably other things on that list that you couldn’t imagine that Christians would differ on. You might think that there is only Christian view about those things. The last few weeks might have been a little difficult for you as a listener to these sermons because I said that genuine Christians disagree about things that you didn’t know there were two views on. I confess to struggling with the whole concept myself. Including passing judgment on those who differ from me. Paul told us to not condemn somebody who came down differently than I did on disputable matters. To not look down them. That’s so easy to do. Anybody here been convicted of judgmentalism the last few weeks? Here’s one for you. The Super Bowl. I have Christian friends who believe that it is wrong for Christians to attend or watch sporting events on Sundays. They believe the fourth commandment prohibits such a thing. I, on the other hand, am planning to go to a Super Bowl party tonight and cheer for Peyton Manning so you can tell which side of that debate I’m on. But I need to be very careful to not look down at those Christians friends of mine and to condemn and judge them. Do you remember the story of Eric Liddell, the Olympic athlete? He believed it was a sin for him to run in the Olympics on a Sunday so he forfeited his spot in that race in the Olympics. Do you judge him for that? A lot of people did then. Including Christians. They felt like he was a missing a chance to show what a Christian can do. What would Paul say about that? Well, he told us in chapter 14, didn’t he? Verse 5? Paul said that each Christian needed to decide for themselves what they believed the Lord was calling them to do and to do that, and nothing but that! But the rest of the Christians were to keep from judging the others for how they answered the question on these disputable matters. What was the big one that Paul was talking about here that seemed to be dividing everybody? Eating meat or only eating vegetables. Many of the Jewish Christians probably could not eat at Hog’s Galore. They weren’t sure the meat was kosher and it might have even been sacrificed to idols at some point. Most of the Gentile Christians unless they had been discipled by a Jewish Christian were fine with eating meat and everything else on the menu. Which kind of Christian was Paul? Well, Paul was Jewish, wasn’t he, but he was fine eating the meat. His conscience said it was okay to eat at Hog’s Galore. The Lord Jesus had called all food clean, and that was good enough for him. So it wasn’t whether or not they were Jewish in background but whether or not they had the faith or confidence to eat or didn’t have the confidence to eat the meat. What was Paul’s word for those who did not have the faith or confidence or assurance that it was right to eat the meat? He calls them, “the weak.” Their faith was weak in that area. So that makes the other side, “the strong.” I think that’s interesting because he’s not being judgmental even though he’s taking a side and even labeling somebody else as weak in their faith. So, it’s not wrong to take a side or to debate the issue, but at the same time we are not to judge our brothers and sisters in Christ if they are not able to do something that we think would be okay. Now, that’s the first step. Don’t pass judgment on your brother. The second step, which we learned about last week, was to keep from putting a stumbling block in their way. Now, that concept was a little more complex. This is when the strong Christian who has the freedom to eat the meat flaunts his freedom in front of the weak Christian and tempts them to sin by doing the same thing, something their conscience says is wrong. The conscience is too important to mess around with like that. It’s a wonderful thing to have a clean conscience, and a terrible thing to betray it. Now, this doesn’t mean that the strong NEVER do the things they believe they are free to do. But it does mean that they look out for the weakness of their brothers. Because if they believe it is sin for them, what? It IS sin for them! Now, at some point, we might talk about the Sabbath and whether or not it continues. Or what the Sabbath is for and what it is not for. But I’m not going to tempt my brother to betray his conscience. No, I’m going to admire him for holding to his principles. I admire Eric Liddell for the stand he took even though I wouldn’t feel that I had to take the same stand if I had been in his place. Now, that brings us to chapter 15. 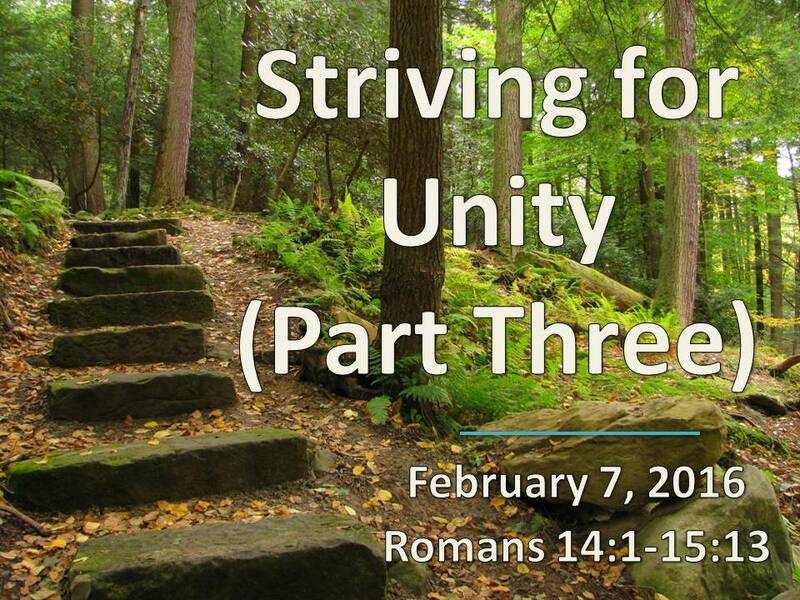 In chapter 15, Paul is going to give us 2 more steps for striving for unity. The first two were what not to do. Don’t judge your brother. Don’t tempt your brother. #1. PUT YOUR BROTHER AHEAD YOURSELF. Verse 1. Paul is basically summing up what he’s said so far. He puts himself in the strong category, and he says that strong Christians have an obligation to the weak Christians. They need to bear with them and to not live to please themselves first and only. He even says to “please” your neighbor. Now, that’s not becoming a people pleaser. Pleasing a person instead of pleasing God. Now, that’s not always easy to do. Especially if it means giving up your freedoms or your rights. We Americans don’t like to set aside our freedoms or our rights. But Christians regularly do to do what’s best for our brothers and sisters in Christ. Jesus calls for us to put our other brothers and sisters ahead of ourselves for their good to build them up. Do you see how that foster unity? When we are making way for each other, allowing each other’s preferences and putting each other ahead of ourselves, how can but be at peace and be unified and mutually edified? I see this all of the time here at Lanse Free Church. One reason we have so much unity here is that so many of you are good at setting aside your own rights and preferences to make allowances for the others. Let’s take worship music for example. There are some strong traditional hymn people here. You want your songs to have Thee and Thou in them. You don’t really care for the drums and the bass guitar and all that. And there are some strong modern worship song people here. You don’t want to sing anything that is older than 10 years old. You want to sing what’s on the radio now and with the full rocking band. Many of us are in between, but some of you are on either end. But you don’t grumble and complain about the other folks. You don’t take your hymnal and go down the street to some other church. You don’t grab your drumset and run away to some cooler hipster church. You give in to each other’s preferences, and it’s a beautiful thing. There are churches that have been split over the so-called “Worship Wars,” but not ours. And it’s not because we all like the same things. It’s because we are committed to putting each other ahead of ourselves. That’s a quote from Psalm 69. And Jesus lived it. Jesus was insulted, scorned, shamed when He went to the Cross, and He did all that for you and me. Now, that’s suffering! We might think it’s hard to deal with our brother or sister in Christ that thinks differently than us, but that kind of suffering is nothing like what Jesus went through for you and me. Doesn’t even compare! I think that we can give up a freedom here or there if Jesus gave up His life for us. Amen? We could say a lot about that verse, even though it’s not the main point here in this passage. Paul is telling us that the Old Testament is still full of lessons for us today. That’s great encouragement for our Sunday School classes who are all in the Old Testament this year studying The Gospel Project. In fact, we’re in still in Genesis right now. Do you remember all that we learned about hope in Romans chapters 5 through 8? Paul is bringing it all back here and he’s going really hit it when we get to verse 13. What a prayer request! Paul prays for unity. He prays literally that they would “think the same thing” as they follow Christ. And he doesn’t mean that they would think the same thing about these disputable matters! He means that in spite of the disputable matters they would think the same thing about following Jesus Christ! That they wouldn’t let anything get in the way of their following Jesus Christ together. We talk about agreeing to disagree agreeably. This says that we would be able to do that on secondary disputable matters because we have the primary indisputable matter of glorifying Jesus in common. The main thing is to keep the main thing the main thing. And the main thing is the gospel of Jesus Christ. And He’s worth the suffering! That word “accept” is actually the first thing Paul said in chapter 14 so this brings a bookend to this teaching on unity. The word for “accept” is stronger than just “tolerate” or “recognize.” This isn’t a grudging acceptance or toleration of another Christian. It means to “embrace” or “welcome” or “receive” that other believer. You put your arms around that brother, and you don’t hold your nose! That’s how we strive for unity! The end goal of unity is not unity. It is worship. That’s how important unity is. It either leads to praise to God or it doesn’t. Now, again, this is with all genuine gospel believing Christians who you might disagree with on secondary issues. We don’t receive and embrace everybody out in the world. Or even everybody that says that they are a Christian. But if they are, even when we disagree with them, we strive to embrace them as brothers and sisters in Christ. When we do, we bring praise to God! Paul just said that Christians in Rome need to accept one another because Christ had accepted them and become a servant of whom for whom? Of the Jews for the Gentiles! And he’s got four Old Testament references up his sleeve to prove it. Did Jesus love the Jews or the Gentiles? Jesus loved the strong and the weak. Jesus died for the Christians who won’t watch the Super Bowl but will watch movies that I couldn’t watch in good conscience. Jesus died for the Christians who will watch the Super Bowl on a Sunday but do not feel free to drink alcohol at it. Is there someone you need to reach out to and embrace? A believer who you differ from? Someone who you need to put ahead of yourself? Someone you need to stop judging? Someone you need to stop flaunting your freedom in front of? Someone who believes in the same Jesus you do? The last verse for today is our new Hide the Word verse, so we’re going to get it burned into our memory over the next several weeks. It’s another prayer. Paul prays this for the Roman Christians, and for ALL the Roman Christians together. There’s that hope again from verse 4. God is the God of hope and the prayer is that all of the believers, not just the weak ones or the strong ones, not just the Jewish ones or the Gentile ones, would be filled with joy and peace (unity) as they all put their faith in Jesus so that they would overflow with hope by the power of the Holy Spirit. Only He can do that. The Spirit must supply the power or we can’t keep from judging our brothers or tempting them to betray consciences. The Spirit must supply the power or we can’t put our brothers ahead of ourselves. The Spirit must supply the power or we won’t accept one another just as Christ accepted us. But if the Spirit empowers us, we strive for unity and bring praise to God. We can be filled with all joy and peace and with one heart and mouth glorify the God and Father of our Lord Jesus Christ. "Keep watch over yourselves and all the flock of which the Holy Spirit has made you overseers. Be shepherds of the church of God, which he bought with his own blood" (Acts 20:28). Two weeks ago, I was privileged to attend this conference put on by the leadership of our association of churches. The teaching was top-notch, theologically rich and provocative, and challenging for pastoral practice. All of the audio is now available for FREE online. Highly recommended.